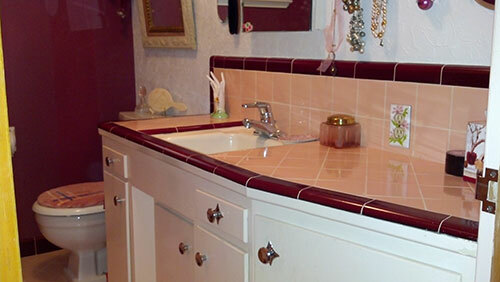 Marsha fell in love with her 1957 peachy pink ceramic tile bathroom the first time she saw it. So, when she noticed water leaking from around the shower a few years ago, she sprung into action to try and save her precious bathroom. 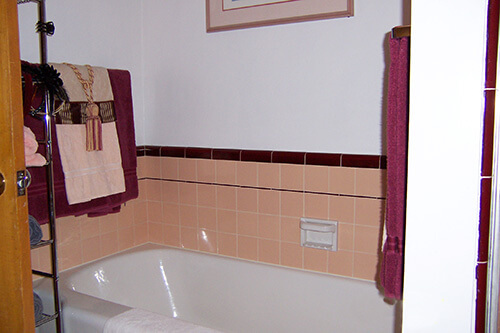 When a contractor confirmed that the shower had to be redone and the original shower tile could not be saved, Marsha was heartbroken — until she discovered that B&W tile offered tile colors that were a near exact match to her original tiles. 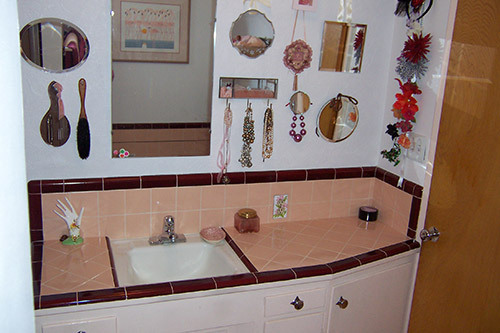 Instead of having to remodel the entire bathroom — or suffer from an obvious tile mismatch — Marsha was able to have her contractor carefully replace only the damaged shower and save her original pinky peach and maroon bathroom. Vintage bathroom lovers rejoice! I have lived in my 1957 house since 1977 shortly after getting married. 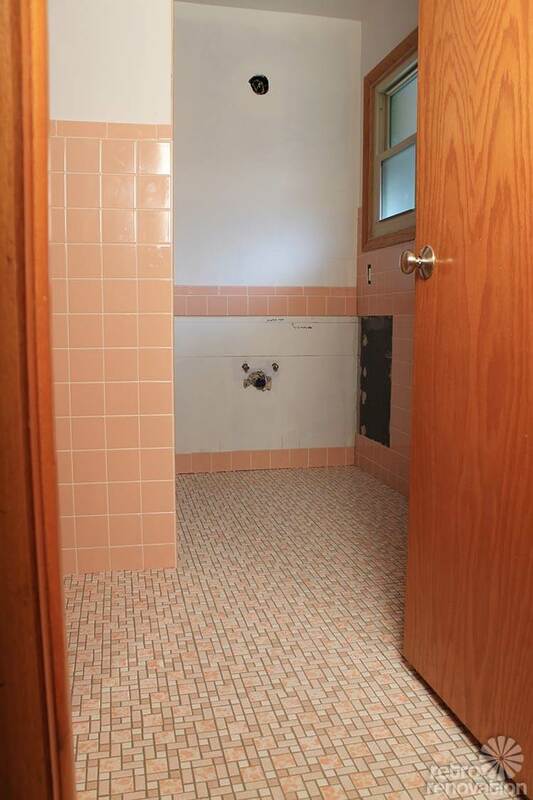 My Ex said he didn’t want to buy the house because the bathroom was Pink. At the time the walls were also painted pink but not an attractive pink. The Realtor said he would help us paint the entire inside of the house white if we would buy it. So we masked off all the woodwork and went with it. 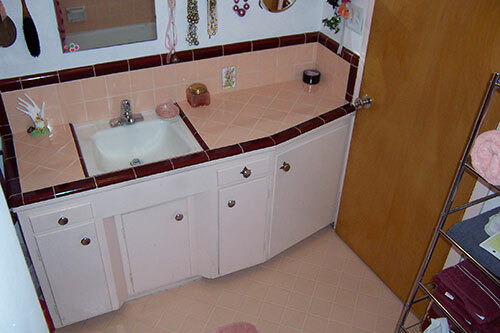 I think the Ex thought he would tear out the pink and maroon tile but we got rid of him before he could do any damage. Incidently, the outside of the house was painted pink as well. About three years ago I noticed my shower wall (drywall) was wet on the outside of the shower wall. My shower floor was leaking into the sub floor as well. I crawled under the house and saw water marks on the wood sub-floor. Luckily no dry rot had occurred. When I contacted my contractor to get it replaced he told me to go find the tile cause the old tile was not going to be saved. I was heart broken for a couple months searching for a match until I found B&W tile out of Carlsbad CA, and located a retailer in Sacramento who carried the tile so I could match samples. I matched my tile almost perfectly. It turns out my Peach/pink tile is “tan” according to B&W. The new Maroon bullnose was a bit darker than the original but not so noticeable and only touched the old tile in a couple small places on baseboard. I caught it early enough so only had to rebuild the shower and my contractor was very careful not to damage any of the floor tiles. He saved a couple of small maroon corner pieces to reuse. I also asked him to save the soap dish and I cleaned the mortar and glue off and he re-installed it. He also added a shampoo shelf that was not in the original. The old shower ceiling was lower than the rest of the bathroom. 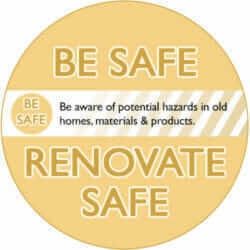 My contractor said in his experience there is probably no reason for it and he would check up in the attic and make sure and remove it which allows more lite in the shower stall. It also allowed me to add a second row of maroon 4×4 tiles as accent at the top. I’ve attached before and after pics of the shower and also included addition pics of the rest of my beautiful 1957 bathroom. 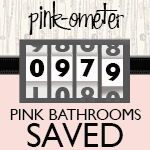 Thanks for helping to Save the Pink Bathrooms. Love mine to death!! Marsha, your hard work has certainly paid off. Your new tile shower is not only nicer — with the higher ceiling and additional storage in the tiled niche — but it also looks as though it could have been original to your bathroom. 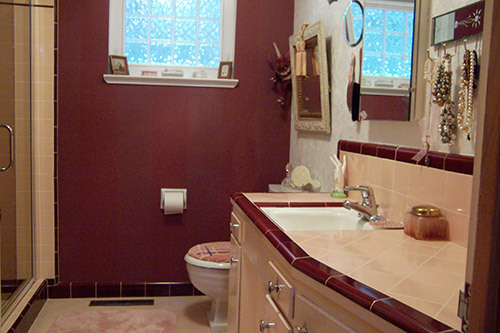 Another great touch is your well-placed matching burgundy accent wall — which works so nicely to add extra color to your charming bathroom. You have the touch! 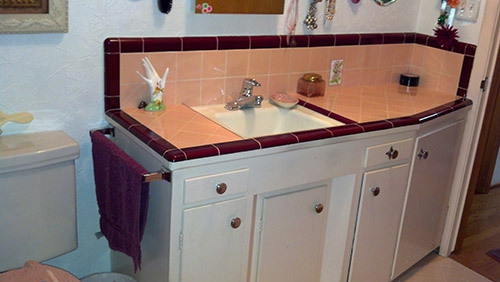 Thanks so much for sharing your story and photos with all of us retro bathroom loving folk — it is always wonderful to hear a vintage bathroom story with a happy ending. 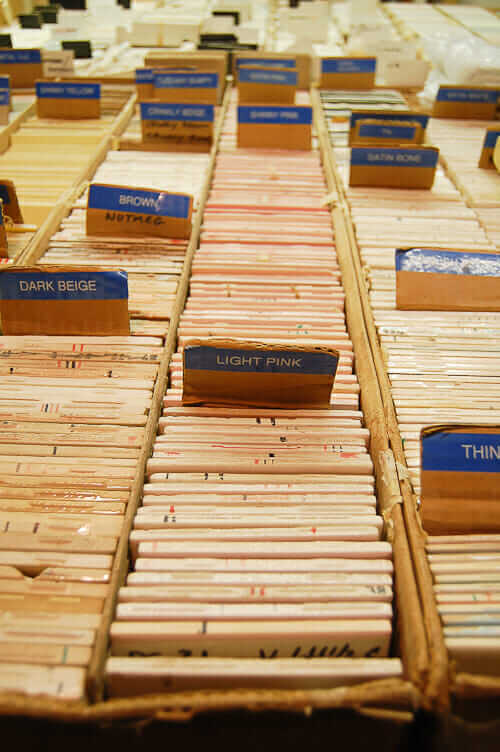 Readers, if you’re looking for replacement tile, B&W is one of our two, key go-to places. Take a look at this story we wrote — pointing to where you can see 20 of B&W Tile’s 52 retro colors online. 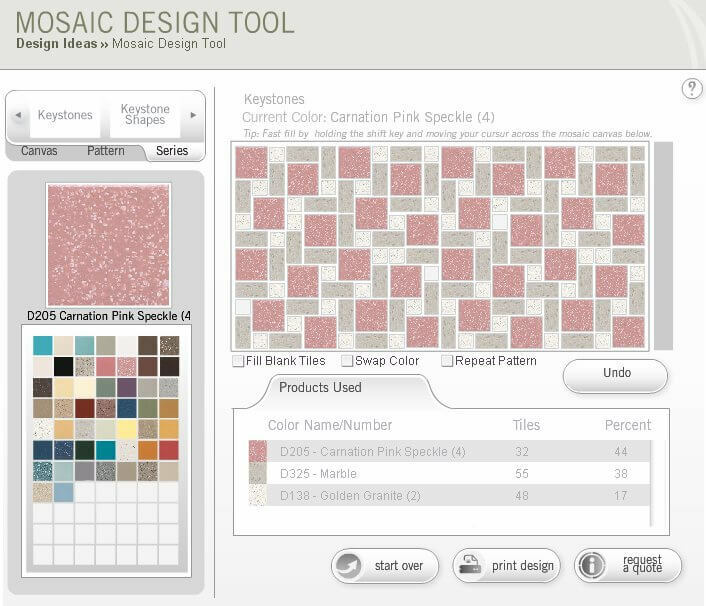 Other go-to source: World of Tile, for time capsule vintage tile. Looks great! 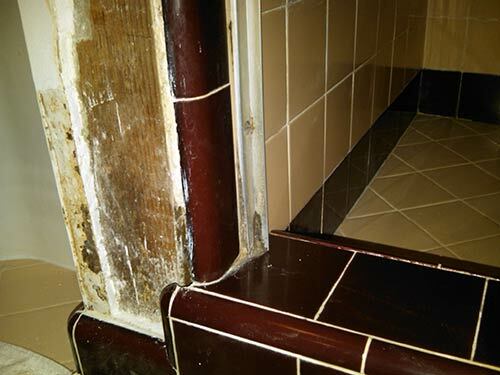 Lucky you to locate close matching tile and also how fortunate to find a contractor willing to work with what is there and save whatever can be saved. I think the canted vanity is such a nice look and am I seeing right – aren’t there just two neat starburst pulls on the top drawer and door at the right? The house and yard are lovely too! Yes, Janet, I have the rest of the starbursts that I ordered a while back to add to the knobs, just had not put them all on yet. That’s great! It is one of those touches that just makes the bathroom! What a happy story! Now that bathroom can go on for decades and decades more! I love the color combo in there. 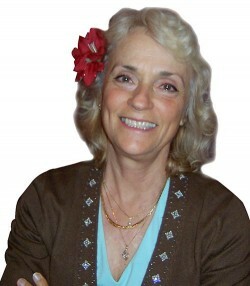 Way to go Marsha! And I agree, it sounds like you have a great contractor. Marsha, great job in persevering in finding the right tile to repair what you had rather than starting over. 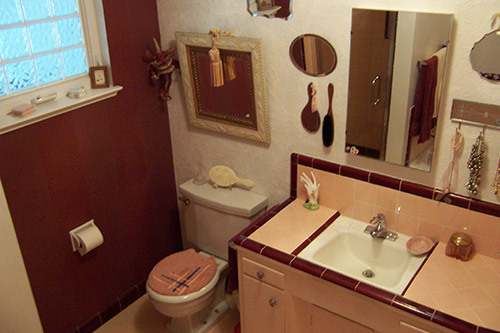 My grandmother had a pink and burgandy bathroom so this brought back wonderful memories. I always thought she had the most elegant bathroom. While she kept her husband, he wasn’t allowed to use that bathroom. He had to use the one in the basement, which I thought was very funny as a little girl. Maybe the truth was that he CHOSE to not use a pink bathroom! The outside of your house is gorgeous, too! 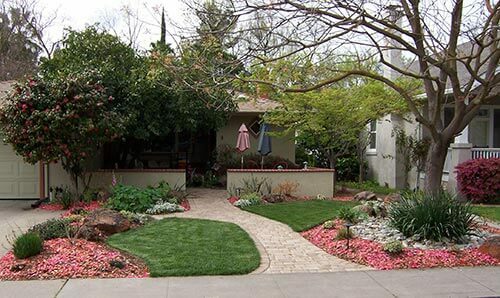 Love the landscaping! SAVE THE PINK BATHROOM STRIKES AGAIN! OMG! Thanks for sharing this Marsha and Pam! The bathroom is just gorgeous and what a wonderful result of what could have been a serious problem! What a great save! Lucky you found a sympathetic contractor. I view a bathroom as strictly utilitarian and as the owner of two small baths I don’t get the attraction for warehouse sized baths. I am glad you were able to save the original charm. Looks very nice! What really caught my eye was the attractive landscaping and the enclosed patio. 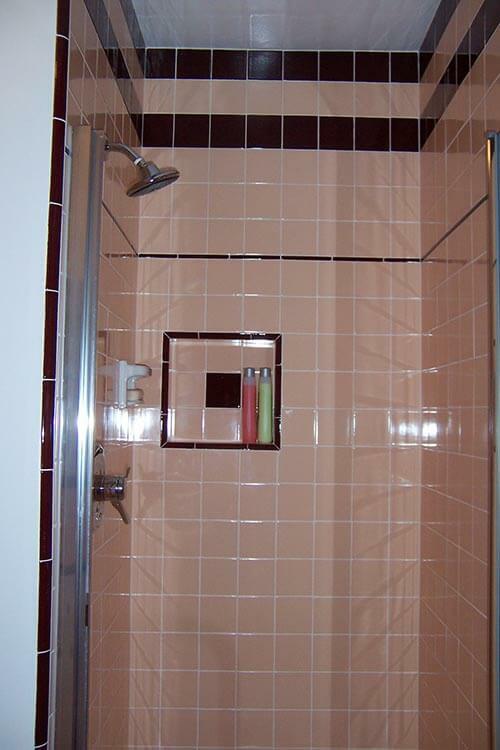 Jay – I tend to agree that bathrooms don’t need to be the size of a two car garage. But I do wish mine was big enough for a sit down vanity. Or maybe a shower AND a tub like Marsha’s (oh the luxury!). 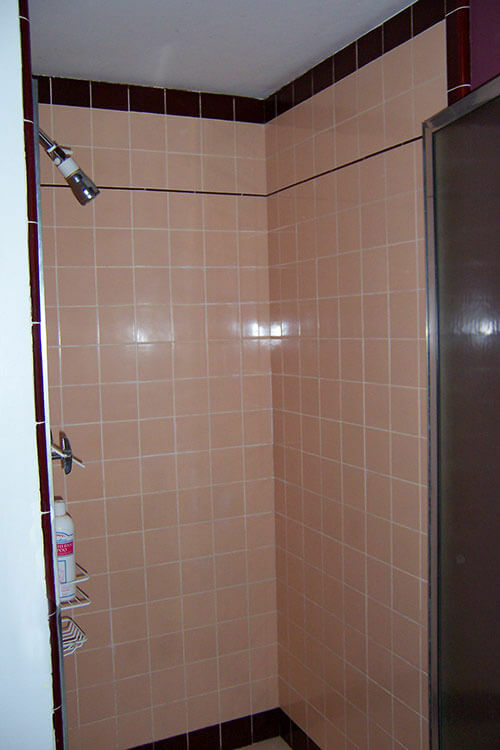 At least mine is easy to clean and once I finally get the walls painted pink, it will be adorable (green fixtures, yellow tile, and pink walls – yowza! ).